Posted on Thu, Mar 22, 2012 : 5:34 a.m.
For the first time since 2005, Washtenaw County's treasurer is reporting a drop in delinquent taxes, and that could be a sign of an improving economy. "We're looking at approximately $26 million in delinquent taxes. Last year it was in excess of $32 million," Catherine McClary told county commissioners Wednesday night. "This is very good news," she said, noting the trend spans cities and townships throughout the county. "All of them have had some type of decrease." McClary said the county has been running about 11,000 delinquent parcels a year, and this year it looks like it might be about 9,500, close to a 15 percent drop. "So we really are looking at a true drop," she said, putting the number into perspective by suggesting that if people are paying their taxes then chances are they're also able to pay their mortgage and put food on the table for their families. Washtenaw County Treasurer Catherine McClary had good news for county commissioners Wednesday night. "You know, paying your real property taxes is not the first thing on everybody's agenda when they're trying to eat and feed their family," she said. "So to see this drop means that we're really looking at something stronger here, so it's my pleasure to bring that report to you." In Washtenaw County, there are 28 units of government and more than 80 different taxing jurisdictions. McClary gave a year-end cash report to the board Wednesday night in which she highlighted that she was able to bring in $860,891 in investment earnings in 2011. She said that's a 0.8 percent return, which she compared to a 0.08 percent benchmark rate set by the Federal Reserve Board. "I know that you're not happy with the yields right now any more than I am, but it is what it is," McClary told commissioners, thanking them for allowing her to focus on making safe investments, not trying to achieve high yields. The report McClary presented shows details of the county's portfolio, including nearly $156 million in total cash and investments. McClary said she used to be able to generate several million dollars in investment income each year for the county and now it's down to under $1 million. "This portfolio, however, is managed for safety first, safety second, safety third, safety fourth, and then yield," she told commissioners. "And one of the things I wanted to thank the board of commissioners for is that I have never been asked to try to generate yield for you." McClary said in some other counties, and even cities and townships, treasurers are pressured by the local governing body to generate yield. "And that's not what we want to do with public funds. You want to invest for safety," she told commissioners. Mcclary noted her office was able to collect nearly $5.6 million in interest and penalties from delinquent taxes in 2011, which is more than $3 million in excess of what the county budgeted. She said that kind of extra money enables the county to do things like dig into its reserves to provide a $500,000 disaster relief fund in the wake of the Dexter tornado. "The board of commissioners has been very supportive of tax foreclosure prevention, and every time we put effort into preventing tax foreclosure, we're really collecting the taxes," she said. "And that's how we have come in with such huge surpluses for the capital projects fund that they've now used a small piece of for the Dexter remedial work." McClary also noted the county took in about $4 million from the local accommodations tax in 2011. She said that figure used to be closer to $3 million. "But as the economy is improving and more people are traveling, that has increased," she said, noting dog licenses also increased dramatically in 2011, amounting to $86,322 in revenue. She attributed that to changes in rates and new policies. 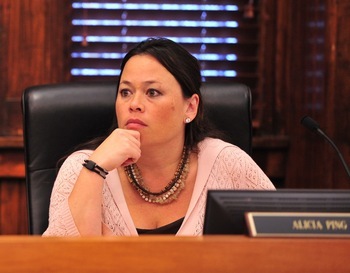 Commissioner Alicia Ping, R-Saline, listens during Wednesday's meeting of the Washtenaw County Board of Commissioners. Commissioners also heard a 2011 year-end financial report from Tina Gavalier, the county's financial analyst, during Wednesday's meeting. The county was expecting to dip $2.9 million into its fund balance to get through 2011, but it ended up with a general fund shortfall of only about $800,000. The county saw revenues from taxes and penalties come in at $63 million, which was $357,335 better than a revised mid-year budget for 2011 had projected. County officials pointed out that was significantly better than the $59.2 million originally budgeted. Gavalier highlighted surpluses realized in many county departments, including the Sheriff's Office, but noted the District Court saw a shortfall of $169,000 due to declining case filings and the Trial Court saw a shortfall of $69,000 due to lower state reimbursement revenues. "The actual revenue shortfall could have been substantial, but additional Sheriff's Office revenues, the police services settlement, property tax and Clerk/Register of Deeds revenues reduced the amount of fund balance needed to fund 2011 operations," she said. The report shows the county took in about $101.2 million in revenues and spent about $102 million in 2011. The county's fiscal year coincides with the calendar year. Gavalier said the figures she presented could change when the county receives its year-end audit in April, though she believes that's unlikely. 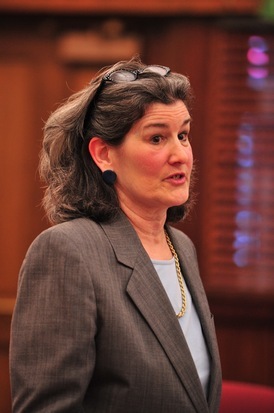 Commissioner Leah Gunn, D-Ann Arbor, said the financial report shows the county "saved a heck of a lot of money" in the last budget year. "This shows to me that we've been very frugal," Gunn said in response to the report. "We've been good stewards of our money." County Administrator Verna McDaniel also had a positive message to share, telling commissioners: "Things are looking up. Things are looking better." Fri, Mar 23, 2012 : 2:12 a.m.
Perhaps people are eating less to make their property tax payments so the government won't confiscate their property that they have worked hard to buy. Maybe instead of driving they are riding a bicycle or walking to work to save enough money to keep the government from confiscating their property. Oh! oops. Nobody owns their property. There is no &quot;theirs&quot; in leasing the property from the government. In Europe the same family can live in &quot;their&quot; house or castle without fear that the government will come and confiscate their property. In the United States the statement; your home is your castle is absolutely untrue. Maybe people are skipping medical care so they can pay their lease payment on property supposedly they are buying. Guess again. Your are not buying the property. YOU WILL NEVER OWN IT unless we the people change the law. HOW ABOUT IT? I would rather pay income tax and know that the property I am buying will be mine, really mine, and the government cannot confiscate and evict me. Thu, Mar 22, 2012 : 1:14 p.m. I get frustrated with the lack of critical reasoning skills. The fact that delinquencies are down does not, by itself, necessarily mean anything positive. Without further analysis we don't know. Maybe the majority of properties have already reverted or undergone a short sale. Picking one number out of the air and supposing that it represents a meaningful conclusion is not correct. This is like looking at an unemployment figure and declaring that the economy is better while ignoring the rest of the report that that figure came from, or saying that the world is saved because the DJ average was up today. Thu, Mar 22, 2012 : 2:08 p.m. Yep...I was gonna say the same thing. However...I do hope she's right. But that's like saying unemployement numbers are down because people stopped looking for a job.